Contributed photo A scene from the Power Paddle to Puyallup. As the sun set, over 100 islanders shared laughs and broke bread together on the bluffs of English Camp on San Juan Island to honor the paddlers of the annual inter-tribal canoe journey on Friday, July 20. 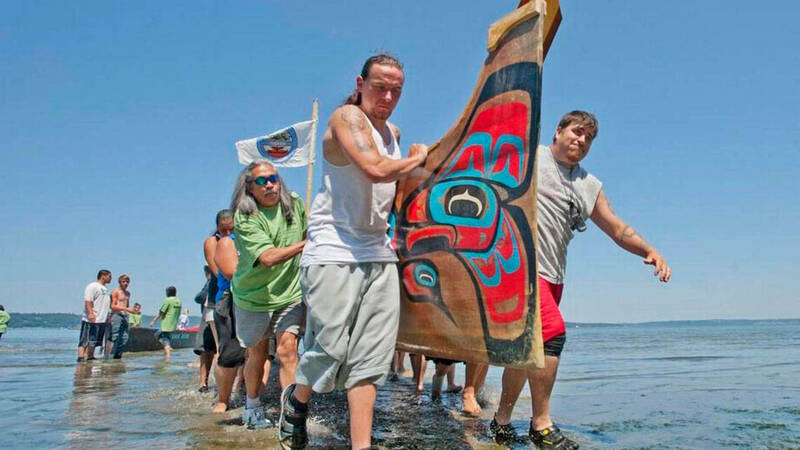 While no First Nations canoes were able to make it, the crowd celebrated them. “Forty people were registered to volunteer. At the event, I couldn’t believe it, another 60 showed up with food and ready to help,” said Donna Vial, who traveled up from California to volunteer. The free community dinner was organized to honor and host the First Nations paddlers who were expected to land and camp for the night at English Camp before stopping at Lopez, July 21. They would then continue toward their final destination, Puyallup, Washington. A last-minute reroute, however, caused many of the paddlers to bypass the San Juans entirely. Four canoe parties camped on Waldron Island. “If you are a boater, you have to be in a constant state of flexibility,” said Stephanie Buffum, executive director of Friends of the San Juans, a local nonprofit that co-sponsored the dinner. One year the weather was so foggy the entire dinner was canceled, and the food was brought to the Lummi Nation by Lummi representatives. He noted that representatives from the Lummi Nation attended the potluck and expressed appreciation for the community’s efforts. They also carried breakfast and snack provisions to Lummi where many of the paddlers had rerouted. The dinner included over 100 volunteers and drew residents from all over the county. Buffum noted that the attendance and local support for the event showed that the canoe journey unites the San Juan community. “We really are just a blip in the entire intertribal canoe journey,” Vial said, explaining that each year the final destination and host tribe changes, and there are dozens of tribes that participate from as far north as Bella Coola, Canada, and as far south as Quinault, Washington. The whole journey includes around 70 stops before reaching the Puyallup Territory of Medicine Creek, July 28, where the Puyallup tribe will host the week-long event “Honoring Our Medicine.” According to Buffum, approximately 100,000 First Nation members are expected in Medicine Creek. 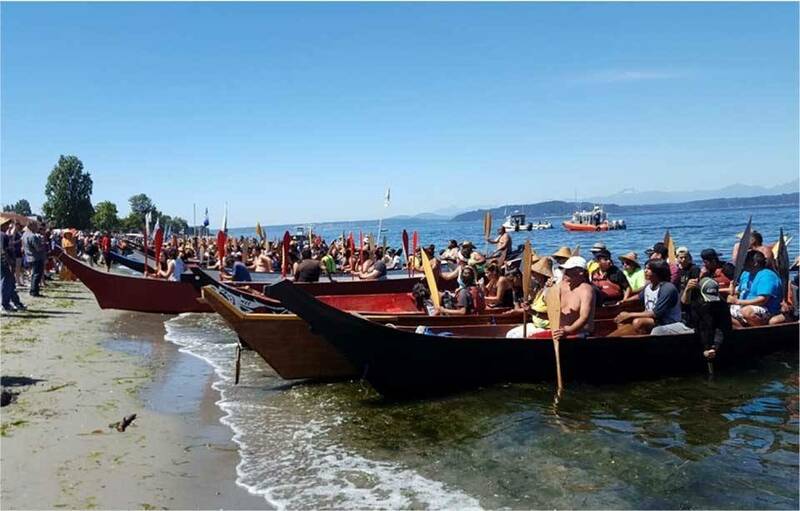 “As we gather with thousands of our relatives from all over our region, and as far north as Alaska and Canada, we will put our canoes in the water to travel and connect with one another as our ancestors did so long ago. During this week-long gathering, we will celebrate and honor the water that sustains us. We invite you to join us in our effort to bring more balance to the Salish Sea. ” To read his full press release, visit paddletopuyallup.org/downloads/PTOI-PressRelease7-15-18.pdf. Molly and Jake of Mr. Believables, Alison Longley; Ace Hardware; Ken Burtness; Thomas Barnes, U.S. Customs; San Juan Island Thrift House; Craig Hansen of San Juan Transit; Marketplace; local farmers; the Presbyterian Church; Episcopal Church, and countless others. “While things did not turn out exactly the way we expected, we can take this year’s experience and be more prepared for next year and beyond,” Ripin said. For more info, visit paddletopuyallup.org/index.php.